It’s ESPN-on-ESPN violence after two sports broadcasters for the network started a war of words over the Los Angeles Lakers’ recent announcement that Magic Johnson would become its new president of basketball operations. It started when radio host Dan Le Batard took to his ESPN morning-radio show to blast Johnson’s promotion. “What you’ve got here, though, is a testament to the power of fame. And a testament to the power of a modicum of charm,” Le Batard said, according to the New York Post. “Because Magic Johnson is charming,” Le Batard continued. “But Magic Johnson was given a late-night television show because he’s famous and charming. Failed in 11 shows. 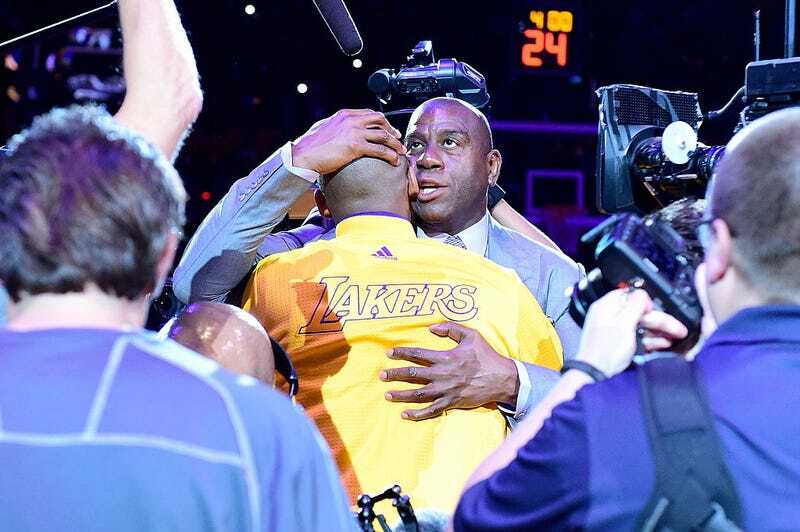 Magic Johnson was given a head coaching job of the Lakers because he’s famous and charming. Failed in 16 games. Magic Johnson, not interesting as a broadcaster, given broadcasting opportunity after broadcasting opportunity, because he’s famous and charming. Johnson even took it a step further, adding that Le Batard’s comments were rooted in racism. The Post notes that Johnson’s co-host, Jorge Sedano, who knows Le Batard personally, insisted to Johnson that Le Batard was no racist. But former Lakers great and Magic Johnson teammate Mychal Thompson called in to the show to shoot down Sedano’s counterclaims. ESPN co-host of Pardon the Interruption Michael Wilbon chimed in to wonder where Le Batard had been the past 20 years, since Magic Johnson has become a success in business. I don’t think this is going to go away anytime soon. And no word on where Sage Steele stands on this debate, but I’d venture to guess that as long as Magic Johnson doesn’t protest against Trump, or stand up for black rights, and keeps his pants belted to his waist, then she’s fine with his promotion.